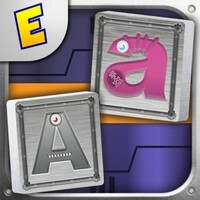 I did not want to play Alphabet Robots Mahjong 2 on the iPhone and iPad. Why not? I knew this downloadable only game was done in the 3D format. My experiences with 3D Mahjong video games has been bad. Like that Mahjong Cub3d game from Atlus USA. What a disaster. Not surprising since it came from Atlus USA. I should have known Ensenasoft would make Alphabet Robots Mahjong 2 a good game. They have a history of making good games. The rotation in Alphabet Robots Mahjong 2 is not as bad as I imagined and had experiences in other 3D Mahjong games. There are eighty-four puzzles for families to play through in Alphabet Robots Mahjong 2. They progressively get larger and more difficult to solve. I was flying around these cubes looking for letters. The best news is Alphabet Robots Mahjong 2 did not give me a migraine. I am familiar with the audio and celebrations in Alphabet Robots Mahjong 2. I have heard them in other Ensenasoft Mahjong video games. The music in Alphabet Robots Mahjong 2 is solid. It helped relax me while I tried to find matches. I found something really cool in Alphabet Robots Mahjong 2 - upper case and lower cases can match. Meaning a capital 'A' and a lowercase 'a' will match and vanish. Alphabet Robots Mahjong 2 starts with a high score. That score drains away quickly. Make a match to add points back. So the faster you solve the entire puzzle in Alphabet Robots Mahjong 2 determines how high your score is. That is also used in the one, two, or three star rating in Alphabet Robots Mahjong 2. I did not worry about the stars personally. Any level is accessible at any point in Alphabet Robots Mahjong 2. I hope to see more games like Alphabet Robots Mahjong 2 in the future. This is a fun app for $1.99. There is also a free trial version so families can try Alphabet Robots Mahjong 2 before they buy it. If you don't like it you are only out the time, and Internet usage to download. It was a pleasure for me to play and review Alphabet Robots Mahjong 2 on the iOS platform.